This leaflet is advertising condiments like ketchup and chutney. 'Ketsiap' was a salty fish sauce first brought back from China in the 1600s. Variations were quickly developed and British alternative flavours included oyster, walnut and mushroom. 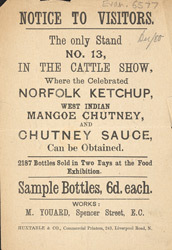 The word ketchup appeared when American manufacturers started selling tomato flavoured sauces in Britain in 1837. The word chutney comes from the East Indian 'chatni' which means 'strongly spiced' or a blend of spices and herbs. Merchants trading with the East India Company brought the sauce back to Britain and it quickly developed into the popular condiment we know today.